screening formats available: 35mm print, HDCAM, Digibeta, Betacam, DV or DVCAM, and DVD. Alone in Los Angeles, Enrique doesn’t speak a word of English. Forced to work as a day laborer to earn money for loved ones back home, his loyalties are put to the test when a simple job escalates into a matter of life and death. 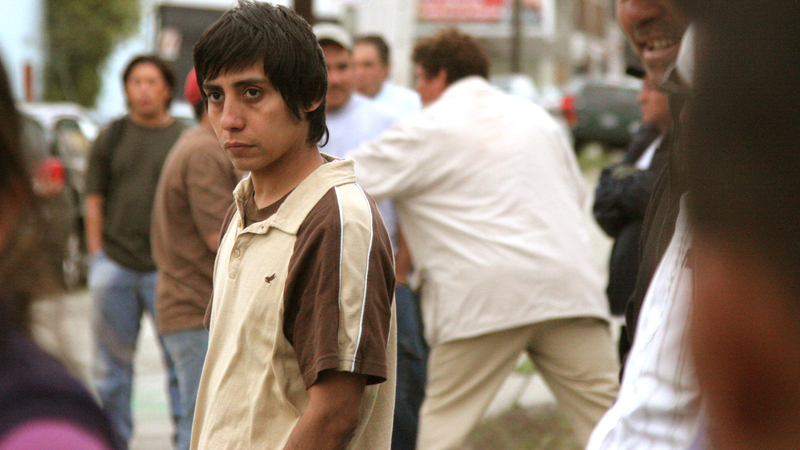 Synopsis: Enrique is a young man far from home trying to make a living wage as a day laborer on the streets of Los Angeles. He thinks he has finally caught a break when Marcus and Kathy pick him up, along with two other immigrant laborers, to help them move. On the job Enrique meets and befriends their teenage son Zack as he helps pack up his childhood room. But things quickly take a turn for the worst when Marcus attempts to pay the men with a check, unaware that day laborers are often cheated out of their wages with bad checks. A simple misunderstanding explodes into a violent standoff with Enrique stuck in the middle. “A Day’s Work” examines the hopes and fears inherent to the immigrant story, both on the part those crossing the border and those learning to live in a rapidly changing America. When violence erupts, the prejudices of all involved are brought to light and mistrust, assumption and language stand as barriers to an easy resolution.